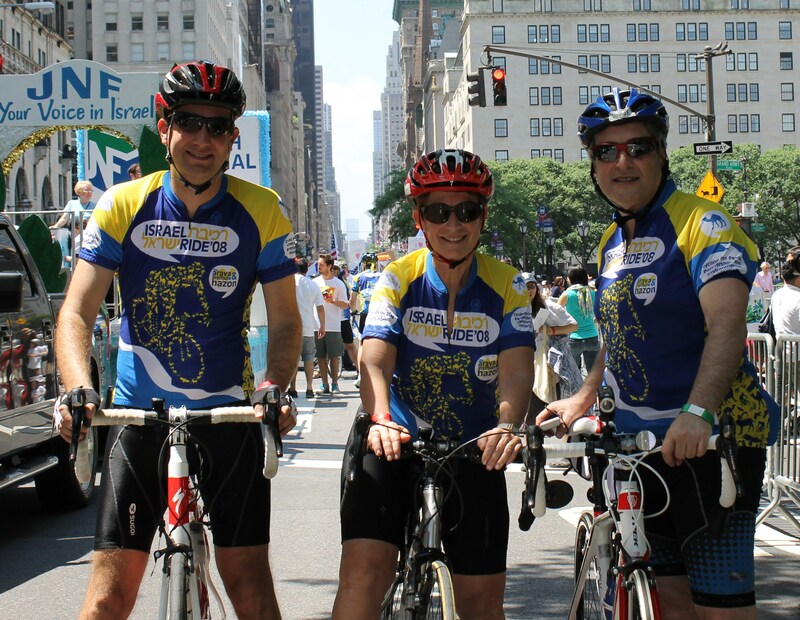 Israelis Celebrate Life on 5th Ave. 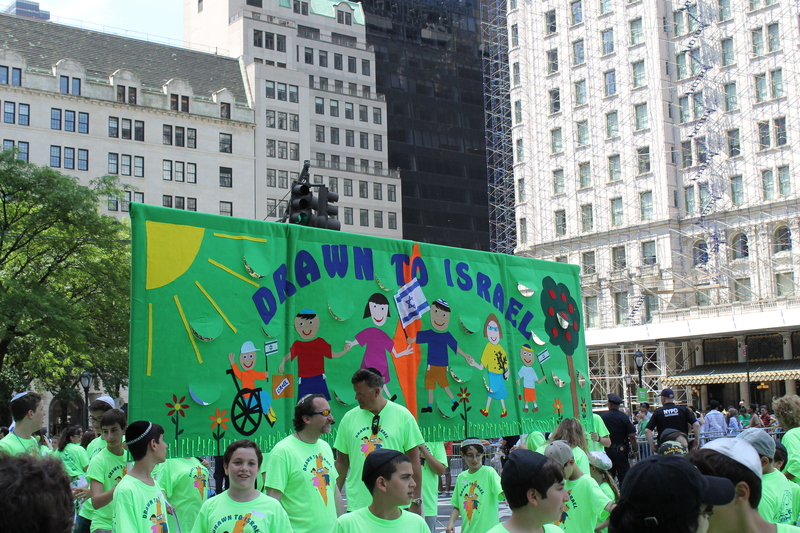 The biggest parade month of the year, June, kicked off with the 49th annual Salute to Israel parade along 5th Ave. and 56th St. with much fanfare and revelry. 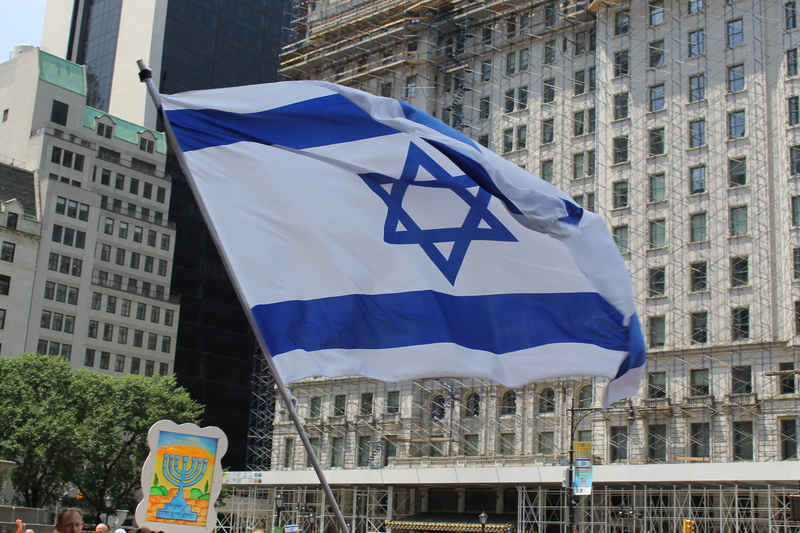 Thousands of viewers lined up on the parade route to see their friends and family march in unity to salute the state of Israel and all its beauty. Each year the parade committee selects a different creative theme for all the various groups to display. 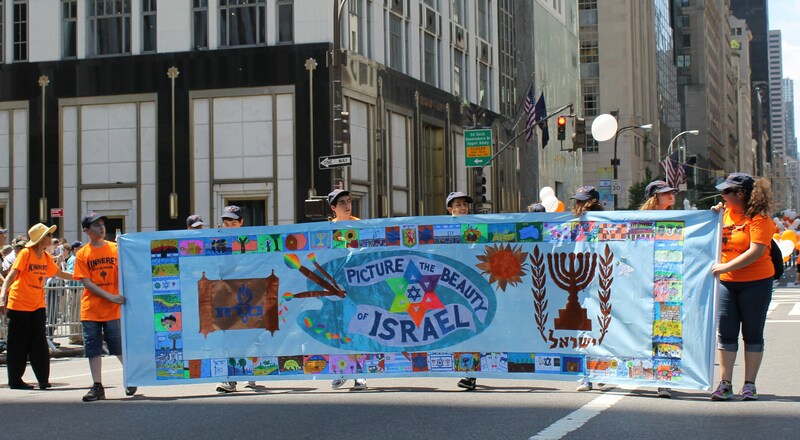 This year’s theme was Picture Israel: the art and the craft. There were some clever banners shown and it was clear it took some time and patience to finish the banners. I was able to take pictures of some of the better ones. The mounted police signaled the start of the parade. The Honorable Mayor Bloomberg was waving the flag of Israel and was soon followed by parade VIPs. 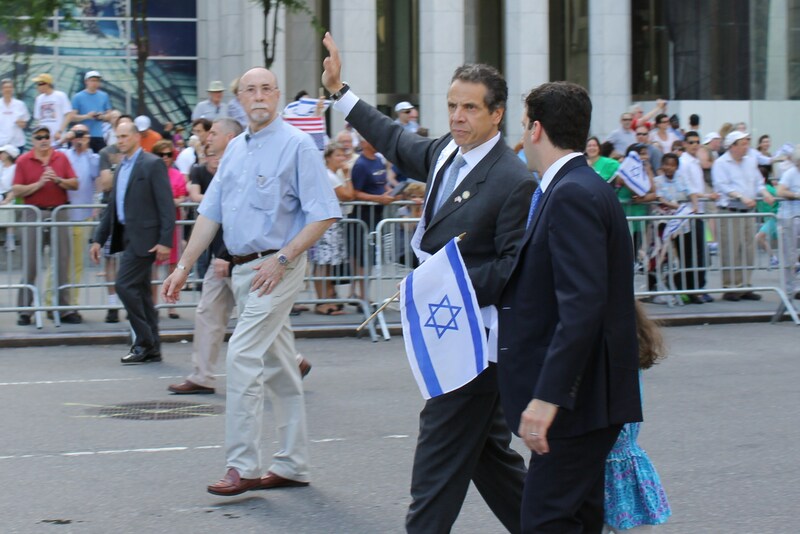 Shortly behind him marched the NY State Governor Andrew Cuomo, a friend of Israel. Then the fun started. 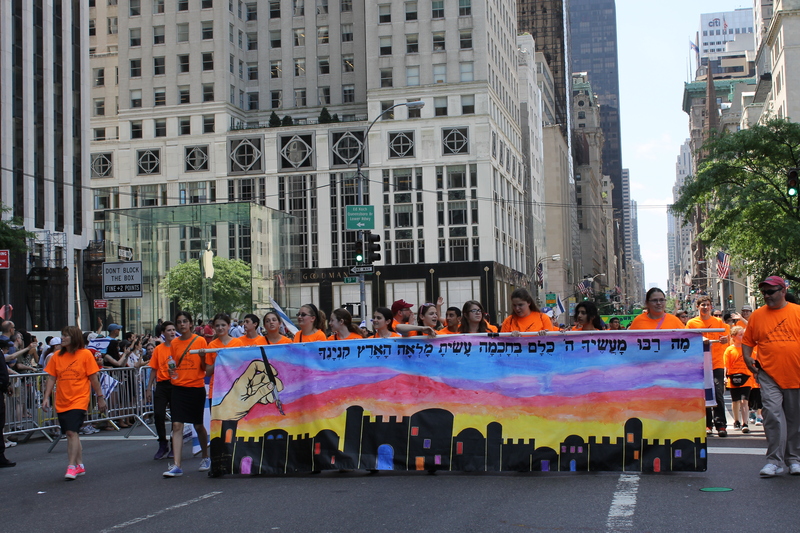 The first of many yeshivas and synagogues from the tri-state area presented their themed banners with lots of energy and pride. Some banners took several months to complete. Many of the banners displayed their devotion to Yahweh and the love of family and humanity. It was great to see the younger generation embrace the values of their ancestors and passing on of the tradition. Things picked up even more when the State of Israel float rolled on by with a band singing joyful songs. The first of several marching bands got things kicking when the Sunriser Drum and Bugle Corp. made their way up 5th Ave. but the band that really set the bar were the Fusion Core band..they really did a great job in keeping the energy level high and keep the celebration going strong. Just as the State of Israel is strong and vibrant, the marchers showed their unity and devotion in this fun family parade. 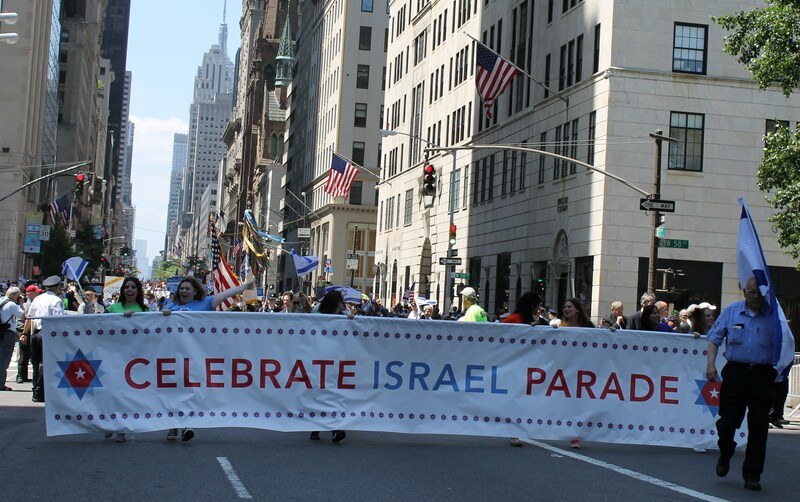 A buzz was clearly felt around 57th St. and 5th Ave. near the start of the parade route in celebration of the 64th anniversary of the creation of the current state of Israel. 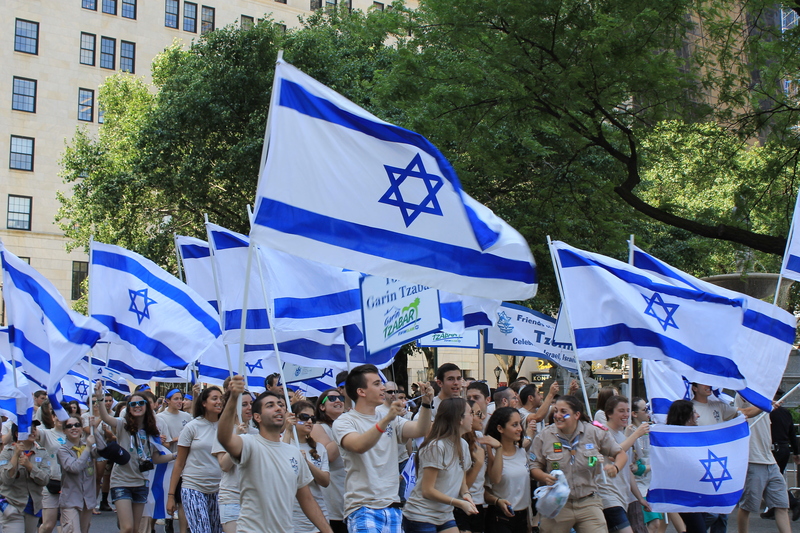 The hundreds of thousands of revelers came out in droves to take in the sun and favorable weather and share in unity with the estimated 35,000 marchers to help salute Israel. 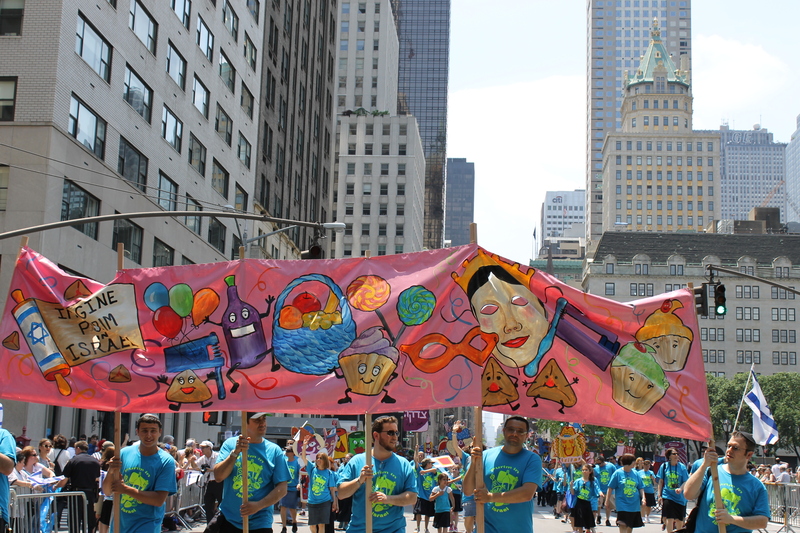 In this 48th rendition of the parade, the theme was clearly seen in every group represented. The Branching Out theme helps the marchers and viewers get in touch with flowers and blossoming and the fruits of one’s labors. Planting seeds and growing in the Jewish tradition and passing it on to the next generation was clearly visible. Each group or cluster hand painted their own mural to keep with the theme of Branching Out. The start of the parade got the crowd worked up especially when the Honorable Mayor Bloomberg waved the Israeli flag with pride. NY State Governor Andrew Cuomo soon followed to the cheers of the crowd. Two powerful figures in NY politics greeted each other in Mayoral hopeful and current NYC Police Commissioner Raymond Kelly and US Representative Carolyn Maloney. The fun started with a series of marching bands and floats that got the crowd worked up. 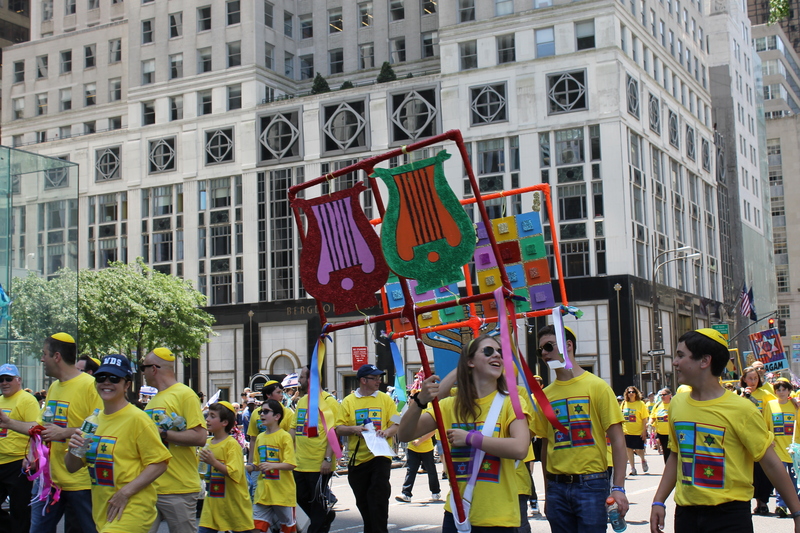 The Hillel Yeshiva float had a live band and were soon followed by a crowd favorite in the Fusion Marching band. The JCRC dancers did a great job in expressing joy for the event in their dance moves. 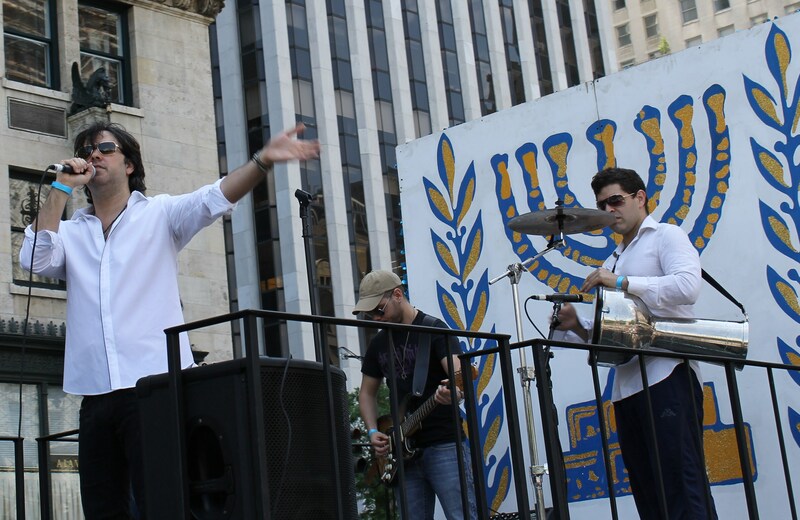 The were helped by the hip sounds of the Moshe Hecht band. Another marching band that played with flair was the Excelsior band soon followed by a cool jazz band in Blue Fringe. A special treat came in the form of the Approaching Storm High Steppers with their unique marching steps. 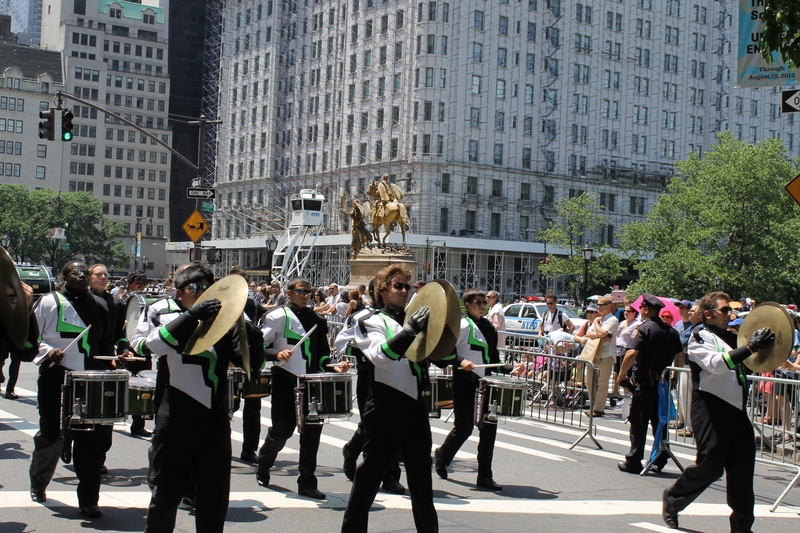 All in all there were 17 marching bands and 29 floats to help make this one largest and proudest parades in NYC. It was a great day to celebrate all the goodness Israel does all over the world as it branches out to help where help is needed in service to our fellow man. MOZEL TOV. A Sea of Blue and White on 5th Ave. 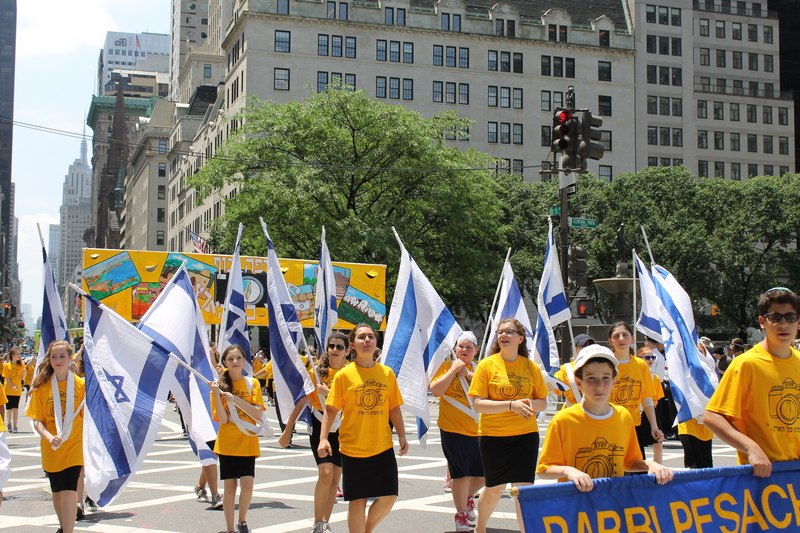 There was much excitement and anticipation as the 47th annual Celebrate Israel Parade was set to start near 57th St. and 5th Ave. Balloons, flags, signs and banners were everywhere in sight. Many stilt walkers and musicians were practicing for their part in the march. 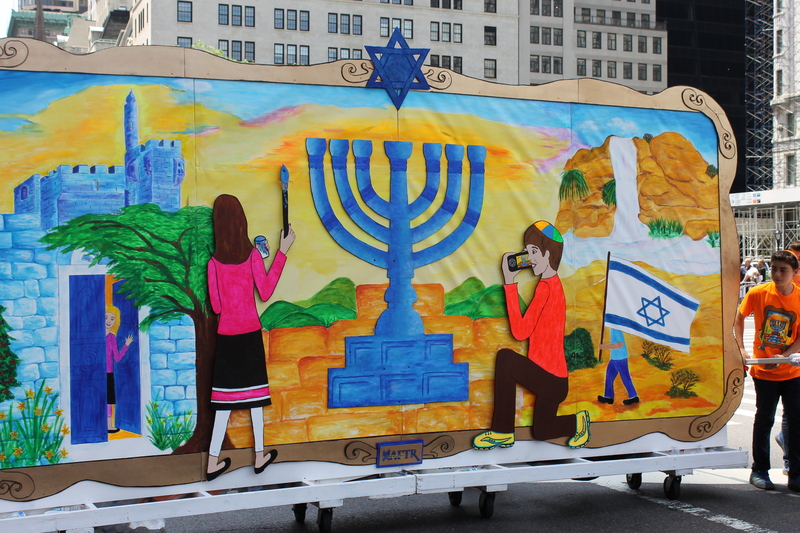 This year’s parade theme – In Tune with Israel – was evident all throughout the particip ants in either their playing musical instruments or a drawing of an instrument on their banner. Rachel was keen on taking some great shots of the activity as she had to rush off to attend the Philippine Day Parade further downtown on Madison Ave. so I made way to 59th St. and passed right by the mounted police, a sign the parade was about to start. The Girls Scouts of Highland Park, NJ kicked off the parade with a large display of American a nd Israeli flags proudly waved by the young scouts and their parents. The NYC Marching band played an upbeat marching song soon followed by the Honorable Mayor Bloomberg and Grand Marshall Joseph Sitt. Nearby where I was recording the event stood NYC Police Commissioner Raymond Kelly. Many VIPs and organizational heads stopped by to shake his hand and have a photo-op. NY State Governor Andrew Cuomo couldn’t even pass up that chance. After the dignitaries passed by, the fun really started. 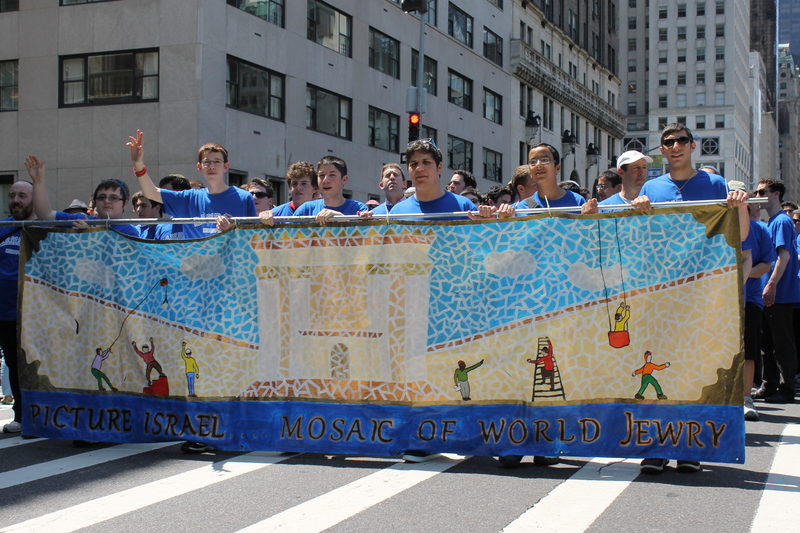 Nearly every Temple, School and Yeshiva from the Tri-State region sent their students and teachers to represent in the spirited event that is the largest of its kind celebrating the state of Israel since its birth in 1948. Over 30,000 marchers and hundreds of thousands parade viewers alike were enjoying the great weather and exuberance of the festivities. At the heart of many of these organizations is the devotion to God, religion, family, tradition, peace, and music. It was clearly seen in many of the marchers but especially amongst the younger marchers especially from the Stella K Abraham High School for Girls as they waved their blue and white pompoms that really got the crowd worked up and excited to be at the event. Not to be outdone was one of the largest participants of the parade, the Yeshiva of Flatbush with their snazzy burgundy t-shirts and large banner in praise of God with the horn and the harp. Greeted with much fanfare were the official delegation from the state of Israel waving hundreds of blue and white balloons and flags. 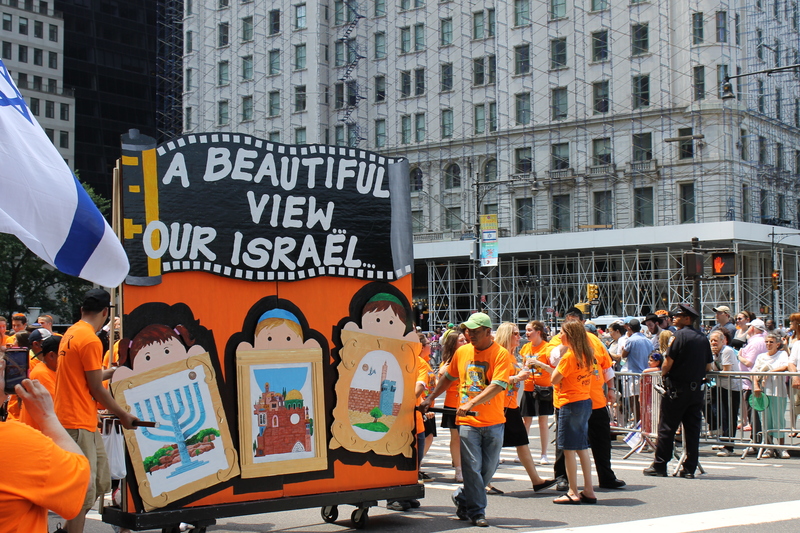 There were many floats gliding up 5th Ave. playing all kinds of music from traditional Israeli music to SoulFarm that played cool jazz to the delight of viewers young and old alike. A parade just isn’t a parade without a marching band and this one had 16 marching bands each one outperforming the other with their precision marching, blaring brass and booming drums. Newcomer Excelsior Drum and Bugle Corp. from Troy, NY were exceptional as I marched by their side until the reviewing stand near 69th St and where the event was broadcast locally and internationally. That’s when I couldn’t help catch the sheer joyful expression coming from Betty and Jack with her parents Sally and Jack, parade veterans from Rockland County. 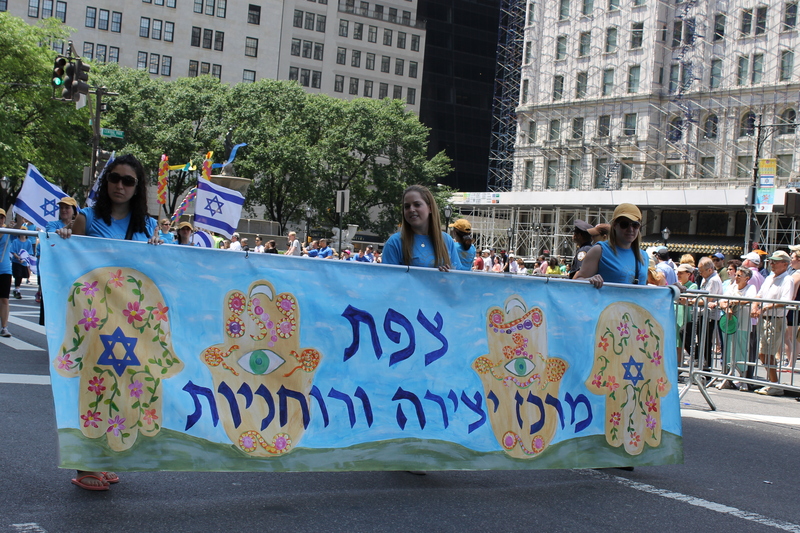 They love coming to the parade and wer e anxious to see their child march by from Yeshivat Noam of Paramus, NJ. It brought home what I had been a witness to the entire day. The passing of tradition from one generation to the next so they will never forget the suffering endured by so many before them and to celebrate the gift of life. 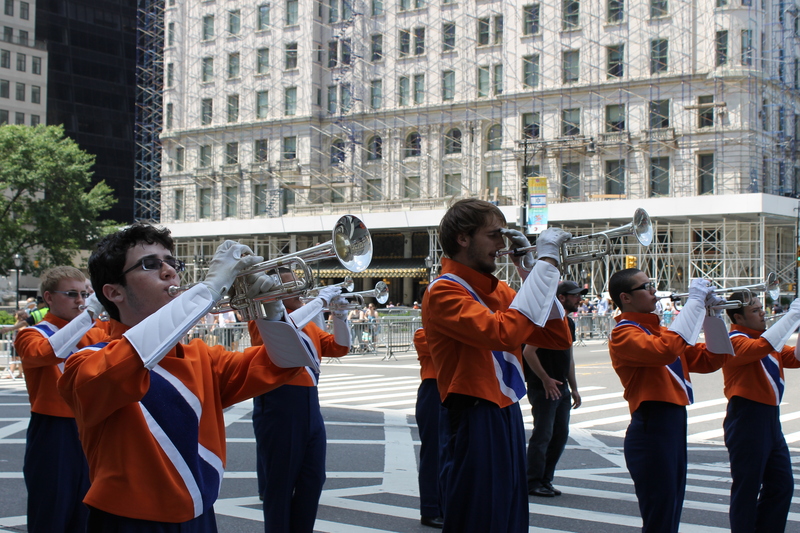 As I made my way down towards the start of the parade again, another newcomer marching band was kicking it in high gear. 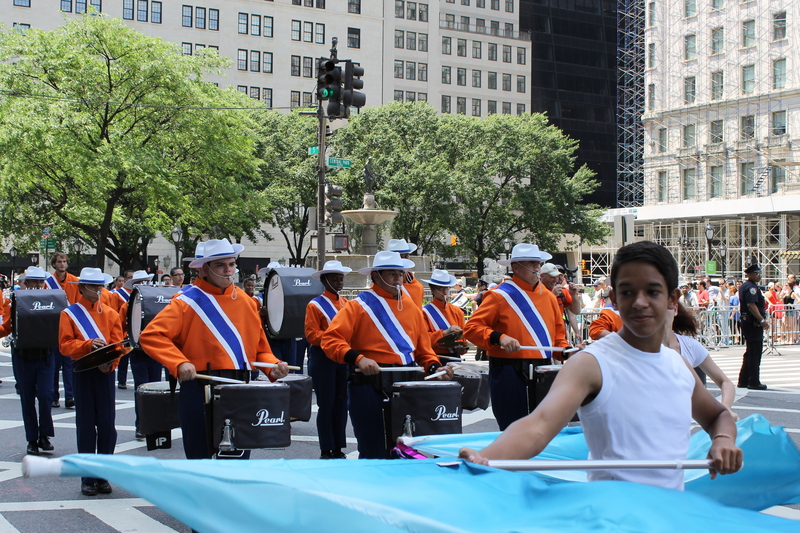 The Shabazz High School Marching Band from Newark, NJ were high-stepping their way up 5th Ave. It seemed as though the crowd doubled in size since I was there just an hour earlier. A sure sign the Israeli spirit is alive and well and endures no matter what adversity presents itself. Am Israel Chai- The Jewish people live.